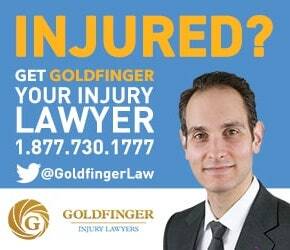 With offices in Toronto, London and Peterborough, Goldfinger Injury Lawyers is able to represent you or your loved ones for their car accident claim, wherever the claim might occur in Ontario. We take a unique approach to your case. Your wellness and rehabilitation are the most important things to us. If you promise to take care of yourself; try your hardest to get better; and try your hardest to return to your normal routine; we guarantee that the rest will take care of itself. Leave the personal injury law to us. You just focus on getting better. Our lawyers have the knowhow, experience and focus to get the most out of your car accident claim. Whether you have a tort claim alone (pain and suffering) accident benefit claim, or both a tort and accident benefit claim, let our lawyers help you when you need it most. What most people don't understand about their auto accident claim is that it may have two components; a tort component and an accident benefit component. Tort law compensates you for your pain and suffering, loss of income, loss of competitive advantage in the workplace, out of pocket expenses, loss of enjoyment of life, Family Law Act Claims, and any other damages which are not covered by your accident benefits. But suing for pain and suffering in Ontario is very difficult. There are a number of rules and regulations which have been introduced under the Insurance Act to minimize the claims of accident victims to prevent their claims from ever getting started. Did you know that in Ontario, all tort claims for pain and suffering are subject to a $30,000 deductible for any amount under $100,000? Most people don't know this until it's too late in their lawsuit. This means that the first $30,000 for any award under $100,000 essentially vanishes! So, at trial, if a judge was to award you $40,000 in damages for pain and suffering following your car accident, after the application of the $30,000 deductible, you would only be left of $10,000 in damages! After payment of legal fees, HST, and disbursements, you probably won't be left with very much. Even worse is if as Judge awards you $30,000 for your pain and suffering; after the application of the $30,000 deductible, you're left with ZERO. Again, this is terrible news for innocent accident victims across Ontario. Governments are constantly trying to fiddle with the deductible. There was no deductible in the 1970's. The deductible used to be $15,000 not too long ago. It has since doubled to $30,000. In addition to a $30,000, tort claims are also subject to a legal threshold to determine whether or not accident victims are entitled to compensation. That threshold, loosely defined is injuries directly related to the motor vehicle accident which are serious and permanent. Serious means they impact on your activities of daily living. The Court will look to see if you can work, if you can participate in your usual housekeeping and home maintenance chores, or if you can participate in your usual recreational activities. In addition to your injuries being serious, they also have to be permanent. Permanent means for the rest of your life. If your injuries lasted you 1 year, but following that year they went away, then the Court will not deem your injuries to be permanent. Accordingly, your injuries will not meet the threshold to sue for pain and suffering. The determination whether or not your injuries meet the threshold for pain and suffering is a legal determination. Judges look to your medical records, medical reports, the testimony from you and your family members, along with any other information which they deem to be relevant to your car accident case. In addition to the tort claim, victims are also entitled to claim accident benefits from their own car insurance company. Accident Benefits fall into Ontario’s No Fault Insurance System. Few people except for personal injury lawyers and people in the car insurance industry really understand what no fault accident benefits are, and what they mean to accident victims. If you have questions about how your benefits work, what you’re entitled to, or how to recover compensation for your car accident claim, don’t hesitate to contact the lawyers of Goldfinger Law for your free consultation. "I thank Jesus every day for introducing me to Brian Goldfinger. God led me to Goldfinger Law, and Brian delivered as the Lord told me he would. After my car accident, I didn't know what to do, who to trust, or where to turn. I was without sight. Brian was my beacon of light in my dark times. Like an angel from the sky, he saved me and brought clarity to my life which got so foggy after my car accident. There's no way I'd be able to type this had it not been for Brian. I'd probably be on the street or in some sort of institution. That ain't no joke. Brian brought me salvation, light and truth in the dark times. I can't sing his praise enough. Bless him."